PITTSBURGH—Hugh David Young, emeritus professor of physics at Carnegie Mellon University, died Tuesday, Aug. 20. He was 82. An influential teacher and mentor to thousands of students, Young was a member of the Carnegie Mellon community for more than 60 years. He was born on Nov. 3, 1930, in Ames, Iowa, and was raised in Mondamin and Osage, Iowa. His father, Hugh Surber Young, was a hardware store owner and his mother, Nellie Sibella Peters, was a school music teacher. He came to Carnegie Mellon (then Carnegie Tech) in 1948 as a freshman. He was one of 10 recipients of the Westinghouse Scholarship. Over the next 11 years, he earned his bachelor's, master's, and doctoral degrees in physics at the university. Over the course of more than 50 years, he taught close to 10,000 students. His devotion to his students reached beyond the physics classroom. His office door in Wean Hall was always open for students looking for advice about school or about life, and he often volunteered to help with first-year orientation programs, fraternities and even a rock-climbing group. He and his wife, Alice, opened their home to students, most famously welcoming students for Thanksgiving dinner each year. "Hugh Young has left an indelible mark on undergraduate education at Carnegie Mellon. With a gentle and caring soul, Hugh touched both the academic and personal lives of many here over more than six decades. 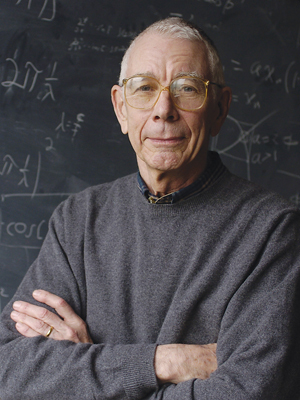 We will greatly miss him," said Fred Gilman, dean of the Mellon College of Science. While completing his graduate degree, he began teaching science courses at Carnegie Tech and continued to teach for 52 years, leaving only briefly for visiting professorships at the University of California, Berkeley in 1967 and 1974. He was named an assistant professor in 1959 and a full professor in 1977. He served as head of the Department of Natural Sciences from 1962 until 1967. He retired in 2004, but maintained an office in Wean Hall until December 2012. His influence extended far beyond Carnegie Mellon's Pittsburgh campus. He helped students all over the world learn physics by having a number of textbooks published, including Addison-Wesley's University Physics. Now in its 13th edition, University Physics is one of the most widely used introductory textbooks in the world. For his dedication to the academic, professional and personal success of his students, he received many awards from the university including the William H. and Frances S. Ryan Award for Meritorious Teaching in 1965, the Carnegie Mellon Alumni Service Award in 1995 and the Robert Doherty Award in 1997. Carnegie Mellon's Mellon College of Science honored him with the Richard Moore Award in 1998 for his contributions to education. In 1995, the Mellon College of Science renamed its graduate student teaching award the Hugh D. Young Graduate Student Teaching Award. Teaching and physics were only two of his varied interests. An enthusiastic organist, he enrolled in the College of Fine Arts 20 years after completing his first bachelor's degree. He earned a degree in music performance in 1972. He took the exam for the American Guild of Organists and earned an associate degree. He was assistant organist at St. Paul's Cathedral for three years. He used his knowledge of music and physics to teach the Physics of Musical Sound class, in which students from different majors studied the science behind how we hear and perceive sound. Young also was an avid outdoorsman, enjoying mountain climbing, skiing, and Jeeping in the canyons of Utah and Arizona. "Hugh's influence and legacy are beyond measure, stretching across generations of students. Even more, his love of learning, the brilliance of his teaching, and his care for his students serve as inspiration for me and the many Carnegie Mellon faculty who were privileged to know him and strive to follow in his footsteps," said Stephen Garoff, incoming head of the Department of Physics. He is survived by his wife, Alice Carroll; a daughter, Gretchen C. Fineman, and her husband, Adam D. Fineman; a daughter, Rebecca S. Young, and her husband, Mark R. Hoffman; his sister, Barbara J. Cuff, and her children, Bridget, Leonard and his wife Terry, and Jeffrey and his wife Penny, and their children; and by a brother-in-law, Leslie J. Carroll, and his wife, Joan. There will be no viewing and no service. A memorial service will be held sometime in the future. Memorial donations may be made to the Hugh D. Young Graduate Student Teaching Award at Carnegie Mellon University, P.O. Box 371525, Pittsburgh, PA 15251-7525. Checks should be made payable to Carnegie Mellon University with the Hugh D. Young Graduate Student Teaching Award noted in the memo line.